It’s been three years since anyone has made it to the summit of the world’s tallest mountain. 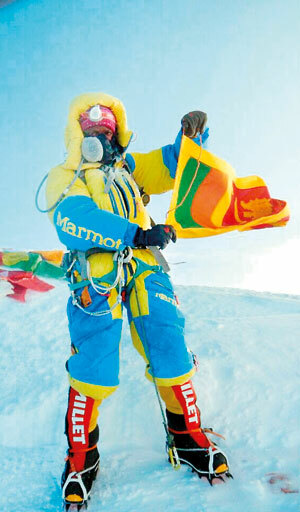 But in May a young Sri Lankan woman climbed 8,848m up to stand on the roof of the world. Just 300m from the summit, her climbing partner was told he was running out of oxygen and would have to turn around. 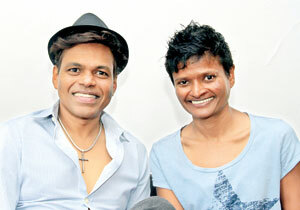 But just by making their audacious climb, Jayanthi Kuru-Utumpala and Johann Peiris have inspired many. Thousands have followed their journey, funded their climb and rooted for them all the way. To have them back home safe feels like a gift in a month when Sri Lanka has had little else to celebrate. Just days after their return from Everest, Jayanthi and Johann still bear the mark of the mountain. The Sun has turned them several shades darker. Each has one cheek that testifies to the ferocity of the wind and ice pouring off the north face of Everest – a small, vulnerable patch of skin between their oxygen mask and their goggles was exposed to the elements and is still bruised and scraped. They also look utterly exhausted. Their triumphant press conference last week went on for hours. They have attained the level of fame where journalists want to share pictures of the two as babies on national television. And yet, they are still healing. Johann’s ‘scissor fingers’, the ones he relies on so much as a stylist, are covered in a thick bandage, and blackened by frostbite. The toes of his feet were mashed together and blood pressure built up, necessitating some terribly painful emergency first aid with a heated needle. Jayanthi, always petite, looks like she’s lost several kilograms too many. But her wide smile still bursts out as she recommends the ‘Everest weight loss diet’ and then cracks up at her own joke. That sense of humour has to have come in handy in these last gruelling months. Before they could even attempt the summit, they had to make it through several rotations between the various camps that would help them acclimatise and build essential skills. Jayanthi remembers thinking that nothing they had done before prepared them for how demanding this process would be. There is no starting easy on Everest – one of the first hurdles is the treacherous Khumbu icefall. It can only be traversed at night, when it is protected from the Sun’s heat and is at itsmost stable. Even then, “it’s like clambering over giant ice cubes,” says Jayanthi, explaining that the ice is constantly melting and moving, at a pace of a metre a day. Crossing deep crevasses on rickety ladders is its own challenge. Huddled in their yellow tents, the two could hear the sound of avalanches on the slopes. The sound was like thunder, and always uncomfortably near. Just last year, one avalanche claimed 18 lives at base camp. Johann saw people die on this mountain, watched as they plummeted to their deaths. He also saw other climbers in distress and could do nothing to help them. “It shatters you,” he says quietly. Walking past the corpse of a man who had died, he says he tried to look away, but could not. More than once, he and Jayanthi feared for their own lives. Their goggles clouded, their bodies deprived of oxygen and their limbs swaddled in bulbous, thick clothing, it was all they could do to set one foot in front of the other. Both say they could not have done it without the constant support of Ang Karma Sherpa and Ang Passang Sherpa. In early rotations, Jayanthi was slow on one of her climbs and her guides cautioned that unless her timing was up to standard she wouldn’t be allowed to attempt the summit. Anxious to avoid a repeat on summit day she went hard, going for the peak like her life depended on it. She took almost no breaks and pushed on, reaching the top at 5:03 a.m. on May 21,surprising everyone including herself with her great timing. From where he stood, stuck behind a line of slow climbers, and running short on oxygen, Johann could see the lights at the summit. Turning back was one of the hardest things he has ever had to do. “But I’ve stood on one of the highest places in the world,” he says, and that is some consolation. So many people have written to him, and he says he’s grateful they know what it was really all about. When asked if they would ever return to the mountain, the two look at each other. Then Johann tells Jayanthi, “Listen, hit me over the head if I ever suggest it, OK?” Laughing, she immediately agrees. Published in The Sunday Times, Sri Lanka on June 5, 2016. Words by Smriti Daniel. Pix courtesy Jayanthi.